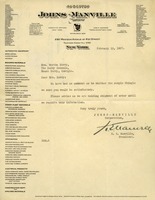 A follow-up letter from H. E. Manville of Johns-Manville Corporation to Martha Berry regarding confirmation of Shingle order. 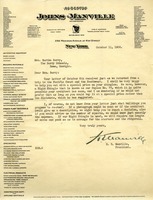 Letter to Martha Berry from H. E. Manville informing her that if she consents that his company will ship the specific shingles she needs at $500.00 in hopes that she can pay that for them. He also informs her that he is very anxious to have her start the project so that he knows her roofing troubles are over. Manville writes to Berry to give her a special price on shingles. He asks whether the architect would rather have a Rigid Shingle than teh Slatekote which has been suggested. He asks that a photograph be sent of the buildings that are to be re-roofed so he can help them reach a decision about the best shingle to use as well as the number needed to work out a discounted price.